THERMAL building solutions company Bondor is pushing its InsulLiving system, to drive growth in the residential sector. The housing project combines InsulWall and SolarSpan to create a thermal envelope, aimed at reducing energy costs and construction outlay. 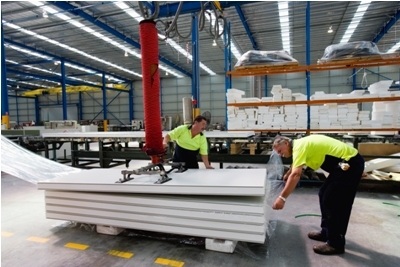 The Brisbane-based company supplies the commercial and industrial sectors with insulated panel products, expanding across six states since inception in the 1950s. General manager Geoff Marsdon (pictured) says Bondor’s internal research and development team designed the new system in the past six years. “That system has essentially replaced the framing of the insulation, the internal walls, the build and cladding with one system, which is enabled to be painted or rendered directly on the steel face. “That’s where we worked with Bluescope Steel, who we asked to develop a revolutionary living system in housing for the Australian market,” he says. Traditionally the company has focused on the food and refrigerated storage industry, but has “diversified into other market sectors” in the last decade. This started from moving into commercial and industrial interests, then into warehouses and the general construction market. “The industry is very competitive and especially the last couple of years, it has been quite a difficult market for everybody really. Marsdon says InsulLiving will be a significant contribution to the company’s growth, as well as housing in Australia. “We see lots of opportunity for energy efficient buildings in the residential sector, that’s one of our big pushers – but also in the commercial sector as well. In an independent study, QUT’s Science and Engineering faculty tested InsulLiving in a prototype house in Burpengary, with a family of four moving in for a year. The house was estimated to achieve an eight star energy rating, surpassing the Australian Building Code’s current minimum of six stars. “When we had the family living in it, it actually performed at 9.5 stars and came out at an energy cost of 44 cents a day over the year. Marsdon says Bondor has expanded its capabilities in the last 12 months with the addition of a new factory and is looking to the future. “In Acacia Ridge, there are three factories alongside each other dedicated to different types of building products, so we’ve increased our capacity by 30-40 per cent. “Now we’re looking at improving the efficiencies of those operations and looking at significant growth into that residential and commercial sector – not just in Brisbane, but around the country,” he says.